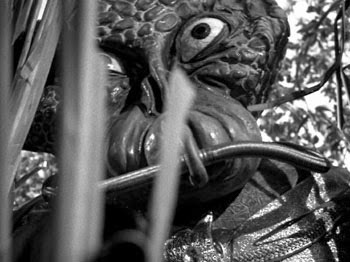 John Kenneth Muir's Reflections on Cult Movies and Classic TV: The Outer Limits: "The Architects of Fear"
"The Architects of Fear" is an early episode of The Outer Limits, and a prime example of the brawny imagination at work behind-the-scenes and the fearlessness (forgive the pun) of the series' narratives. The episode commences with a montage of pure panic and 20th century angst: the specter of a nuclear attack. Civilians dash about the streets of a bustling metropolis and a missile is seen streaking across the sky. A nuclear mushroom -- the enduring and iconic image of terror during the Cold War Era -- flashes on the screen suddenly. "Is this the day?" The Control Voice asks. "Is this the beginning of the end?" The voice continues to meditate on the possibility (or probability?) of man's self destruction, noting that when the apocalypse of nuclear destruction arrives, there will be no time to ask "why." It's a terrifying and grim thought. And that single thought is the terrifying place where a cabal of very intelligent, very learned men at "United Laboratories" dwell and obsess. They live in that moment, in that instant, in the terror of "what if" and so begin to hatch a misguided plan that they believe will insure the survival of the human race. This was the fourth "scare" about nuclear arms in recent weeks, and so these men, led by Professor Gainer, come to the conclusion that the nations of the Earth must "unite" against a common foe if man is to survive the nuclear age. And furthermore, that it is one of this brain trust who "must submit to the ordeal." As if in explanation of this remark, the camera focuses on something sitting near the good doctor. Beside Professor Gainer sits a chattering, monstrous thing in a box, a beast seen in shadows but heard squealing. It is not just a monster, it is the embodiment of the cabal's fear...calling them to a grotesque and horrible mistake. One that they will all regret.. The men at United Laboratories draw straws in a lottery and Allan Leighton (Robert Culp) is selected for the "ordeal." So these men of science, these respected men of great intelligence, set about concocting the greatest hoax in human history with Leighton as their willing guinea pig. Allan accepts his macabre fate in stride ("can't see how making a fuss is going to help...") but there are drawbacks, even besides his own transformation and eventual death. For one thing, Allan is hopelessly in love with his wife, Yvette (Geraldine Brooks). They have been trying for years to conceive a child and now -- just moments after Allen takes the first hormone shot spurring his "Thetan" side -- he learns that their problems are gone...that Yvette can (and is...) pregnant. Carrying his child. Suddenly, this symbolic act, this scarecrow-ing of the human race, doesn't seem that important to him. But he sticks with the plan, trying to believe in the mission. What follows in "The Architects of Fear" is the story of a rational man who -- like Brundefly in Cronenberg's remake of The Fly in 1986 -- becomes a thing and faces the slow, steady dissipation of his humanity. Unlike that (great) film, here the physical transformation is suggested, not seen. The process is mostly hidden in shadows and hinted at via other cinematic tricks (such as the careful placement of objects in the forefront of the frame). As the humanity drains away from Allan, he explains what this process has done to him. He no longer possesses a human mouth, so he is forced to speak through an electronic voice box, a visual symbol of his separation from his natural species. What Allan says in this condition speaks to much about the human condition. The pain of the surgeries is gone now, he tells Gainer, and his mind is consumed with one thing: strange dreams of Yvette, the wife he had to leave behind. This is all that's left of Allan's humanity: this spark of love, this connection to another soul. It lingers in him, and nothing about the transformation can take it away. Allan asks Gainer if their plan can work, and Gainer replies that "millions have soldiers have gone into wars of hate with worse odds." This is true, but Allan's very humanity is the thing that makes the mission fail. And the scientists never accounted for this factor in their equation. Once in space (and bound for a landing at the U.N.) some part of Allan's latent humanity calls to him and either consciously or subconsciously he changes course. He lands his ship not at the U.N. headquarters, but near the lab...near his Yvette. A group of hunters shoot this alien "Thetan" when they encounter it, and a wounded Allan ultimately dies in the arms of his wife. When the "monster" before her shows a familiar gesture, Yvette realizes that this thing -- this monstrosity -- is her husband. Allan's entire journey has been not about saving the world, but about holding onto his humanity; reconnecting with the wife (and unborn child) he was separated from. Naturally, Yvette is disgusted with Gainer and the others. She believes that there is no honor in dying for a remote, ivory tower ideal. That such a death means nothing in terms of love and family. "Men like you...playing tricks," she says angrily. "A scarecrow would change everything!" she mocks them. "The Architects of Fear" ends with the Control Voice acknowledging this mistake and furthermore adding that "scarecrows and magic and other fatal fears do not bring people together." On the contrary, suggests the narrator: a humble attitude, hard-work and sacrifice - like Allan's sacrifice - are the only things that make our world a better place in the end. Today, we in the U.S. often live in a culture of fear. It is a culture in which fear (and anger...) is ramped up at every opportunity. It is a fear of the other, whether that "other" is of a different religion, a different political group, a different race, or a different sexual orientation. "The Architects of Fear" remains timely and vital because it suggests that there are no easy answers to conquering fear. Even a "scarecrow" can't unite us for long. What can? Education, perhaps, understanding, compassion, decency....our core human values. In one sense, "The Architects of Fear" also offers the tired old acorn of "egg head" scientists going off and doing something stupid; tampering in God's domain, as it were. But on the other hand, what the story truly and deeply concerns is the dissection of the human organism. Take away our ability to speak, replace our kidneys, transform our skin and replace it with green scales...and still the "human in us" (the soul?) calls out for the things that make our existence special. A wife. A child. A dream for a better tomorrow. Still one of the most poignant, thoughtful episodes of this classic TV series, John. John, you must have some psychic link to me: I received The Outer Limits box set for Christmas! I just watched this episode the other day for the first time (I have seen almost none of The Outer Limits, amazing, I know) and was very impressed by it. 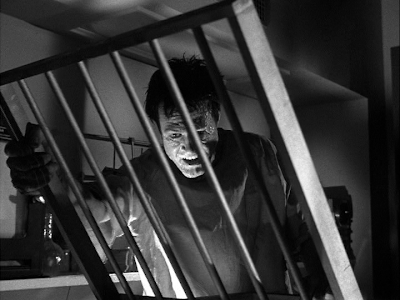 Can't wait to see Culp again in "Demon With A Glass Hand", one of the few episodes I *have* seen more than once.